Elvis Presley has achieved 21 number ones on the UK Singles Chart, more than any other act. The UK Singles Chart is a weekly record chart which for most of its history was based on single sales from Sunday to Saturday in the United Kingdom. Since July 2014 it has also incorporated streaming data, and from 10 July 2015 has been based on a Friday to Thursday week. As of 27 January 2017[update], 1319 singles have reached number one. The chart was founded in 1952 by Percy Dickins of New Musical Express (NME), who telephoned 20 record stores to ask what their top 10 highest-selling singles were. Dickins aggregated the results into a top 12 hit parade, which was topped by "Here in My Heart" by Al Martino. NME's chart was published each week in its eponymous magazine. The sources, in accordance with the official canon of the Official Charts Company, are the New Musical Express chart from 1952 to 1960; the Record Retailer chart from 1960 to 1969; and the Official UK Singles Chart from 1969 onwards. The calendar year that has featured the most UK number ones is 2000, which featured 42 singles reaching the top spot; the year with the fewest number ones is 2016, with 10 songs, followed by 1954, with 11 songs topping the chart, just ahead of 1956, 1962 and 1992, with 12. 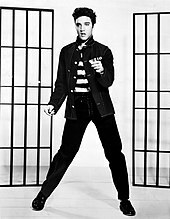 The act that has achieved the most number ones is American entertainer Elvis Presley, who has topped the chart 21 times – Presley's second number one, "Jailhouse Rock" was the first single ever to debut at the top of the chart. The most successful band are The Beatles, who have achieved 17 number ones on the chart. The Beatles' first chart-topper, "From Me to You", reached number one in May 1963. In the 1970s the required number of sales needed to top the chart was roughly 150,000. During 1992, when few releases were reaching number one, sales of CD singles were low: songs needed to sell only 60-70,000 each week to remain at the top. In 2000, when turnover of number ones was high, tracks could often sell between 100,000 and 200,000 copies in a single week. By May 2007, a single needed to sell just 20,000 copies in order to reach number one. UK chart commentator James Masterton remarked in 2003: "When record sales are high, public interest in a song expires very quickly and this creates a need for ever more new product to take its place." Sales figures improved in 2008 and continued into the early 2010s, peaking in 2013, before declining over the next few years as audio streaming became popular. Eventually, streaming was incorporated into the sales chart. Graph showing number of UK number-one singles for each year since 1953. The 2011 figure is projected. Al Martino's track "Here in My Heart" was the first single ever to top the UK Singles Chart, and the only single to reach number one during 1952. The Beatles topped the chart 17 times during the 1960s, more than any other act that decade. Madonna is the most successful female solo artist in the UK, having achieved 13 number-one singles. Bryan Adams's first number one, "(Everything I Do) I Do It for You", spent 16 consecutive weeks at number one, longer than any other track. Spice Girls have claimed the most number one's for a female group in UK chart history. They have had nine number one hit singles in total. Westlife is the most successful band in the 2000s with 14 number one singles. As of 2017, Tinie Tempah (above) and Calvin Harris have had the most UK number-one singles in the 2010s, with seven in total. ^ "Return of the king". Music Week. London: CMP (29.01.05). 29 January 2005. ISSN 0265-1548. OCLC 60620772. Archived from the original on 1 February 2014. Retrieved 5 April 2012. ^ Martland, Peter (1997). Edge, Ruth (ed.). Since records began: EMI, the first 100 years (illustrated ed.). London: Batsford. p. 253. ISBN 9780713462074. OCLC 37740500. Retrieved 5 April 2012. ^ a b c Masterton, James (31 March 2003). "dotmusic.com – Chart Commentary". dotmusic. Archived from the original on 1 April 2003. Retrieved 5 April 2012. ^ "Asda axes the CD single as pop fans hit the download button". Daily Mail. London: Associated Newspapers. 23 May 2007. Retrieved 5 April 2012. ^ a b c d e f g h "All the Number 1 Singles". London: Official Charts Company. Retrieved 26 July 2015. ^ "All the Number One Singles: 1960". London: Official Charts Company. 2010. Retrieved 24 March 2012. ^ "All the Number One Singles: 1961". London: Official Charts Company. 2010. Retrieved 24 March 2012. ^ "All the Number One Singles: 1962". London: Official Charts Company. 2010. Retrieved 24 March 2012. ^ "All the Number One Singles: 1963". London: Official Charts Company. 2010. Retrieved 24 March 2012. ^ "All the Number One Singles: 1964". London: Official Charts Company. 2010. Retrieved 24 March 2012. ^ "All the Number One Singles: 1965". London: Official Charts Company. 2010. Retrieved 24 March 2012. ^ "All the Number One Singles: 1966". London: Official Charts Company. 2010. Retrieved 24 March 2012. ^ "All the Number One Singles: 1967". London: Official Charts Company. 2010. Retrieved 24 March 2012. ^ "All the Number One Singles: 1968". London: Official Charts Company. 2010. Retrieved 24 March 2012. ^ "All the Number One Singles: 1969". London: Official Charts Company. 2010. Retrieved 24 March 2012. ^ "All the Number One Singles: 1970". London: Official Charts Company. 2010. Retrieved 24 March 2012. ^ "All the Number One Singles: 1971". London: Official Charts Company. 2010. Retrieved 24 March 2012. ^ "All the Number One Singles: 1972". London: Official Charts Company. 2010. Retrieved 24 March 2012. ^ "All the Number One Singles: 1973". London: Official Charts Company. 2010. Retrieved 24 March 2012. ^ "All the Number One Singles: 1974". London: Official Charts Company. 2010. Retrieved 24 March 2012. ^ "All the Number One Singles: 1975". London: Official Charts Company. 2010. Retrieved 24 March 2012. ^ "All the Number One Singles: 1976". London: Official Charts Company. 2010. Retrieved 24 March 2012. ^ "All the Number One Singles: 1977". London: Official Charts Company. 2010. Retrieved 24 March 2012. ^ "All the Number One Singles: 1978". London: Official Charts Company. 2010. Retrieved 24 March 2012. ^ "All the Number One Singles: 1979". London: Official Charts Company. 2010. Retrieved 24 March 2012. ^ "All the Number One Singles: 1980". London: Official Charts Company. 2010. Retrieved 24 March 2012. ^ "All the Number One Singles: 1981". London: Official Charts Company. 2010. Retrieved 24 March 2012. ^ "All the Number One Singles: 1982". London: Official Charts Company. 2010. Retrieved 24 March 2012. ^ "All the Number One Singles: 1983". London: Official Charts Company. 2010. Retrieved 24 March 2012. ^ "All the Number One Singles: 1984". London: Official Charts Company. 2010. Retrieved 24 March 2012. ^ "All the Number One Singles: 1985". London: Official Charts Company. 2010. Retrieved 24 March 2012. ^ "All the Number One Singles: 1986". London: Official Charts Company. 2010. Retrieved 24 March 2012. ^ "All the Number One Singles: 1987". London: Official Charts Company. 2010. Retrieved 24 March 2012. ^ "All the Number One Singles: 1988". London: Official Charts Company. 2010. Retrieved 24 March 2012. ^ "All the Number One Singles: 1989". London: Official Charts Company. 2010. Retrieved 24 March 2012. ^ "All the Number One Singles: 1990". London: Official Charts Company. 2010. Retrieved 24 March 2012. ^ "All the Number One Singles: 1991". London: Official Charts Company. 2010. Retrieved 24 March 2012. ^ "All the Number One Singles: 1992". London: Official Charts Company. 2010. Retrieved 24 March 2012. ^ "All the Number One Singles: 1993". London: Official Charts Company. 2010. Retrieved 24 March 2012. ^ "All the Number One Singles: 1994". London: Official Charts Company. 2010. Retrieved 24 March 2012. ^ "All the Number One Singles: 1995". London: Official Charts Company. 2010. Retrieved 24 March 2012. ^ "All the Number One Singles: 1996". London: Official Charts Company. 2010. Retrieved 24 March 2012. ^ "All the Number One Singles: 1997". London: Official Charts Company. 2010. Retrieved 24 March 2012. ^ "All the Number One Singles: 1998". London: Official Charts Company. 2010. Retrieved 24 March 2012. ^ "All the Number One Singles: 1999". London: Official Charts Company. 2010. Retrieved 24 March 2012. ^ "All the Number One Singles: 2000". London: Official Charts Company. 2010. Retrieved 24 March 2012. ^ "All the Number One Singles: 2001". London: Official Charts Company. 2010. Retrieved 24 March 2012. ^ "All the Number One Singles: 2002". London: Official Charts Company. 2010. Retrieved 24 March 2012. ^ "All the Number One Singles: 2003". London: Official Charts Company. 2010. Retrieved 24 March 2012. ^ "All the Number One Singles: 2004". London: Official Charts Company. 2010. Retrieved 24 March 2012. ^ "All the Number One Singles: 2005". London: Official Charts Company. 2010. Retrieved 24 March 2012. ^ "All the Number One Singles: 2006". London: Official Charts Company. 2010. Retrieved 24 March 2012. ^ "All the Number One Singles: 2007". London: Official Charts Company. 2010. Retrieved 24 March 2012. ^ "All the Number One Singles: 2008". London: Official Charts Company. 2010. Retrieved 24 March 2012. ^ "All the Number One Singles: 2009". London: Official Charts Company. 2010. Retrieved 24 March 2012. ^ "All the Number One Singles: 2010". London: Official Charts Company. 2010. Retrieved 24 March 2012. ^ "All the Number One Singles: 2011". London: Official Charts Company. 2011. Retrieved 24 March 2012. ^ "All the Number One Singles: 2012". London: Official Charts Company. 2012. Retrieved 18 June 2012. ^ "All the Number One Singles: 2013". London: Official Charts Company. 2013. Retrieved 24 March 2012. ^ "All the Number One Singles: 2014". London: Official Charts Company. 2014. Retrieved 24 March 2012. ^ "All the Number One Singles: 2015". London: Official Charts Company. 2015. Retrieved 24 March 2012. ^ "All the Number One Singles: 2016". London: Official Charts Company. 2016. Retrieved 24 March 2012. ^ "All the Number One Singles: 2017". London: Official Charts Company. 2017. Retrieved 24 March 2012. This page was last edited on 16 March 2019, at 11:16 (UTC).